I've already posted it in couple of other places but here's a small game I did for RK/LE 2017. It's a DMG version of Lumberjack previously released on C64 and Amiga. Enjoy! The graphics look nice but the game kills me before I have a chance to find out what I'm supposed to do or get used to the controls. Well, it's a score attack type of game - making it easy would be pointless. You only use left/right or B so there's really nothing to get used to. Just avoid owl and chop the tree to increase time bar. That's all. Game & Watch games are also score attack games but ease you into it. This game is quite punishing if you aren't familiar with it. Don't get me wrong, it's very pretty and I'm glad you made it! The lack of any instructions makes the game quite frustrating. I understood how to use Left and Right, but I don't have the slightest idea what A does, nor how to dodge the owl - it kills me every time. Well, this is not a G&W game, next time maybe. Punishing? I wanted it to be somehow since in early versions Cobe (author of original) did 999 easily. Besides I like short and challenging games. The more you play the more familiar you get. But this is a matter of taste. ISSOtm if you understood how to use Left and Right then you mastered controls. Really! There's nothing more, A or B (forgot already) maps Right for convenience. To avoid owl you simply switch side, if there's a branch then chop it first then switch. I'm really surprised I need to explain such obvious things. I gave this game to a person who doesn't own any handheld console and it was like 2-3 deaths and he already knew how to play. I didn't say a word. When I tried C64 and Amiga versions it was the same. I didn't even think for a second someone would need instructions for this. Playing it on an emulator certainly complicates things a little. My natural inclination was to switch sides with left/right and press a button to chop. Of course pressing the button moved me to the right side, which on real hardware might seem reasonable, but on an emulator with the arrow keys on the right side of the keyboard and the A/B buttons mapped on the left side made it feel more like a bug. I'm sure the fact that everything is so fast is a feature of the game, but until the player realizes that the movement and chop occur as a single action, things can feel quite twitchy. That might just be on me for expecting move and chop to be distinct actions. There is a certain finesse to making a game that teaches itself, and I'm certainly no expert. 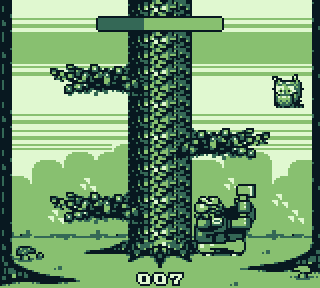 Throwing a dive-bombing owl at a player in the first second before they even figure out the left/right movement, and then making them sit through a forced 10 second death and game over screen is jarring. Shortening the retry loop might help a bit. Telling players that the original author of the game found it too easy before it was changed, or that someone with no experience figured it out quickly, does little to change the fact that on a board with relatively little activity you've had 3 distinct people express confusion or frustration with the controls or game play. Getting feedback can be hard. It might be worth considering where people are coming from. You're right, getting any _valuable_ feedback is hard and I don't have time to wait for it on forums, etc. Every compo has its deadline and I also had other things to do. It was simple case, author of original, me, pixel artist and then random tester. You really don't need more for such simple project. Also, as you mentioned, emulation can complicate things but it's not my fault. I play my games on real HW even if it means using obsolete LPT devices. Anyway, I understand your point. Game is too hard. OK, but I like it that way. Owl is nasty because that's the idea. It's random so again it depends on your "luck". I've just played 5 rounds on GBA and it was between 7-12 chops before it appeared. Then in next game it appeared immediately. To sum up, I think it's a trend today. There's plenty of games and people want everything easy, explained and well balanced. If I ever do commercial project I will consider it. But don't count on it when it's free, compo game I made just for fun. The problem is, the timer is already very hard (in my opinion) to manage on its own, so the owl is coming on top of that and I don't manage to master this yet. Also, I believe pure randomness is a bad idea, since the owl can (in theory) be extremely crippling during a session and almost absent during the next. I prefer when there is a balance (ie. the owl cannot spawn during X after its last spawn, but it will spawn at least before Y after its last spawn. Not sure if that was all clear.). That plus the game over being very long and unskippable makes death very frustrating (compare Super Meat Boy, where you die often but respawn instantly, which makes it difficult but still fun). My suggestion to balance out the luck factor would be to make the owl less likely to appear if the timer is low - so players struggling with the controls will not be bothered too much, but players that can chop more easily will get the owl more often. Also it can create a nice challenge : players that figure out that mechanic will try to keep the timer low, with the risks that this incurs. I don't think things are "too easy" now. However, I think that if you don't care about how the game will play for others but only for yourself, you shouldn't publish it. You don't have to include our suggestions and feedback into this game either, but you should probably think of them the next time you make a game and intend to publish it. Also, you should always remember that what is obvious to you won't be for everybody. & dodge the owl ! would do the job perfectly. Also why not difficulty levels ? They'd just make the timer drain slower/faster and the owl appear more/less often ? Nevertheless, I respect that this was made during a compo, thus with limited resources (time, mostly) and that you are not willing to change the game as it is. What tbsp and I are expressing is feedback, which while you may not apply it to this game, you might on later ones ; so when you say "lol it's obvious", it's kind of frustrating, and I think you can understand why. It feels like a mocking "git gud". Maybe we aren't the right public for this kind of game, though. I'll branch out a bit on the topic of emulation : I'm also developing a game (with my own team), and we came to the conclusion that hardware players are much more rare than in the nineties ; thus, we decided to make our game as emulator-friendly as possible, but this sometimes clashes with our other goal (make the game as technically and visually impressive as possible). We chose to pick technical awesomeness over emulator conveniency (as long as it's not too crippling on emulators), but still make life easier to emulators whenever possible, keeping in mind the larger part of the user base will use emulation. I was about to swoop in like a white knight and tell off all the haters, but dang, it is pretty hard The gameplay reminds me a little of Flappy Bird, hehe. It looks amazing, though! The art is great. Is it just me (or BGB), or is there a branch sprite glitch every time you chop at the tree? Just to make sure not to be misunderstood: I certainly didn't intend to badmouth this game. I know very well how much effort it takes to code something like that and I have respect for anyone who is able to do it. I simply wanted to point out that I neither understood the goal of this game nor how to achieve it. ...but on an emulator with the arrow keys on the right side of the keyboard and the A/B buttons mapped on the left side made it feel more like a bug. And just by the way: In my opinion, it's absolutely mandatory to use a game controller when playing on an emulator. Try playing your favorite games on a computer keyboard and you'll know what I mean. Even a masterpiece like Super Mario Land or Mega Man will play like crap. I also had no intention of badmouthing the game, and fully appreciate the limitations of a compo game. I agree that game controllers are critical for any play beyond quick checks. Sadly, I had no controller available when I gave this a shot, and was merely trying to identify what I believed to be a source of confusion for some people. However, I think that if you don't care about how the game will play for others but only for yourself, you shouldn't publish it. That's the most ridiculous comment I've read in a while. If I didn't care then I wouldn't ask those 3 people for opinion while coding this. And going by logic above, no game that is too hard for you or explained well enough should be released. Well, I beg to differ so "git gud" or just don't play it.